Turns out there are still a few items out in the garden. Which is excellent. 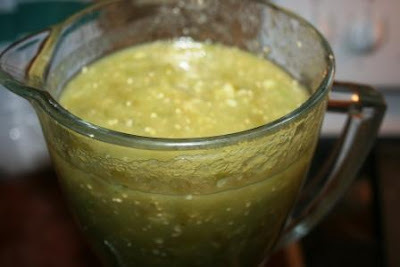 Tomatillos became massive batches of salsa verde this weekend. Oddly enough, I totally forgot to put in all the cilantro I bought, but we didn't notice until I found the cilantro in the fridge later. Turns out it's delicious even without the cilantro! Paul declared the salsa verde his favorite thing from the garden, even though he totally hates the plants and thinks they're a pain. I also picked the last of my second beet crop. 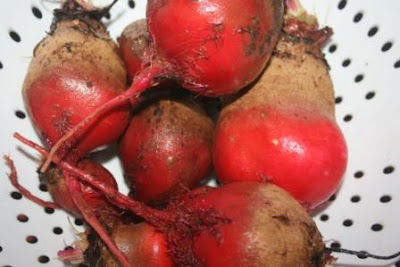 These are those cool striped beets on the insides. We'll enjoy them roasted one night this week. And then I'll cry over not having garden fresh beets until next June. 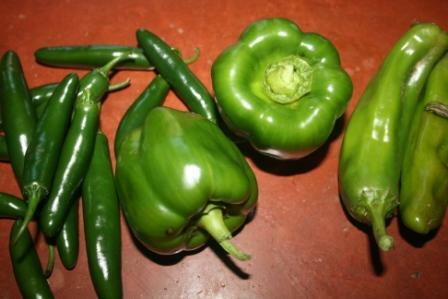 And finally, we still have a bunch of peppers growing - serrano, bell, and New Mexico Big Jim. The peppers were all a bit late this year, and I'm hoping our first frost will hold off a bit longer because there are quite a few more bells out there that I'd love to grab if they get big enough. Oh yes, and not to forget the little farmers we're growing too. This picture was taken just seconds before a shoving match that resulted in both boys on the floor. You'd never really know they're twins, would you? This post linked with Farm Friend Friday at Verde Farm. Your garden is amazing! I had forgotten that there was still so much to be yielded at this time of year. Yummy! Your cutie pie boys are just that - cutie pies! The little farmers are so cute! You harvested so many wonderful things from your garden this year. You have really had a fantastic garden. Glad you're still enjoying it. Our beets were terrible this year..no idea what happened! You might want to be looking for a couple of sticks. You will need some sturdy ones to beat off the girls in a few years. Those little farmers are going to be grown up before you know it. And kids have to grow like darn weeds too! I'm glad you were able to get a picture of Reid and Cort before all heck broke loose-they are so cute! Glad you got a few last items from your garden Lisa. We did not put much effort into ours this year--a good thing since flooding wiped everyone's efforts out anyway. I hope you and your farmers have a super weekend. Great timing on the capture of the boys before the big shoving match! Too funny! Good you are still enjoying your veggies from the garden. Those beets look sooo good! Your two farmers are the cutiest...I love their coveralls! Boys-will-be-boys! Those beets are really pretty! But this picture of the boys is my favorite YET!!! And your little story to go with it has me laughing!!! Adorable farmer boys! They are definitely developing their own looks, for sure. really amazing you grow so many vegetables! omg, the boys are sooo cute! Such adorable little farmer men you have! All of this stuff you do amazes me! wherever do you find the energy and have these little misters hanging around? you are awesome! I've been away for so long, your boys have really grown! So cute, but don't tell them. Your little farmers are cute as can be! I just love overalls in little boys! Terrific on the garden goodness! Your produce is still looking great! I've never tried growing meets before. I'd be interested to see if my kids would like them. My twin brothers were like your kids one a whole head taller. My twins I still have a hard time telling them apart....My peppers never came through this year I am so jellous yours look delicious! Salsa verde is our favorite!! Yummy!! Those veggies look great! And so do those two boys ... so cute. 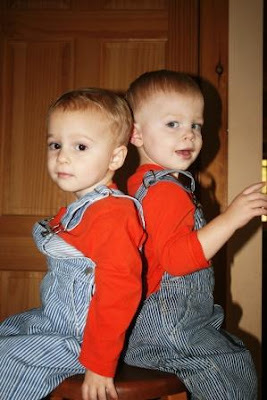 Your little boys are adorable in their matching coveralls!! You must really miss your fresh veggies during the winter months. Enjoy these last gifts from the garden while you can. They are the cutest little farmer boys! Can't believe you are still getting veggies from your garden. Ours was a dud this year. I don't think I have anything left in my garden. I've never had Salsa Verde...do you use a recipe? The boys are cute little farmers! Hi, Me again. You asked about uses for Pineapple sage. This site has some good ideas. your veggies are so beautiful- and so are your little farmers! You guys have really benefited from the garden. I love salsa verde also and it looks wonderful! I always enjoy tiptoeing around your garden.